The road corridor of Esplanade North in the island of Venice is the most likely destination for condo buyers whose searches are fixed on multi-story condominium units located in a scenic Gulf front of this south Sarasota city. There are plenty of choices of Venice condos for sale in the row of buildings along Esplanade North, and the newer units amongst these could be found at Beleza on Venice Beach. Located on 811 The Esplanade North, this condominium was built in 2005 as an eight-story residential building in a parcel directly located beachfront. Notably, this condominium is one of two Venice construction projects undertaken immediately prior to the last housing downturn which halted residential construction in all of Sarasota for several years. The only newer condo units in Beleza’s Esplanade North neighborhood is the small, boutique community of Che Vista just across the street. Given their vantage point, the condos for sale at Beleza on Venice Beach provide some of the most spectacular views and sunsets in its neighborhood. The Gulf vistas it allows sweep from north to south, akin to the coastal panorama seen mostly in the keys or barrier islands off the Florida mainland. The Beleza complex likewise brings to its residents a host of amenities that are prerequisites to an island lifestyle. Its facilities include a clubhouse with a bar and a barbecue area, a heated pool and spa, plus a fully equipped fitness center. The condo building also has backup generators and secure underground parking along with guest parking spaces. The condominium’s Esplanade North location, moreover, is convenient to all the various points of interest that Venice Island offers. Beleza residents, for instance, are just a short walk northwards to the Higel Marine Park, which offers boat docks and kayak launches as well as picnic areas. Towards east, they can as easily access the quaint shops and restaurants at the historic Venice downtown. 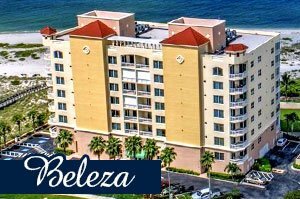 The condos for sale at Beleza are typically priced starting from the $700s for two-bedroom units. The price point hits the $1 million‒$2 million mark for Beleza penthouses and upper floor units featuring floor areas of about 2,200 square feet designed with two bedrooms and two baths and a half. At more moderate price points, the beachfront row of Beleza has several likely alternatives for prospective buyers. South across the street of Beleza stands the seven-story Gulf Twin Towers built in 1968. Three new listings surfaced here January 2018 which were priced in the $300s for their living areas of 1,165 square feet designed with two bedrooms and two baths. Other choices are adjacent north of Beleza in the nine-floor Sansovino built in 1974. Available units here come in two-bedroom, two-bath layouts within floor plans of approximately 2,500 square feet and offered starting from the $500s. 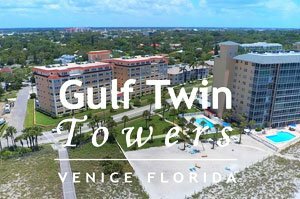 At the same price range, the nearby Gulf Horizon with 10 floors built in 1970 could also offer some options for two-bedroom units with living areas of approximately 1,200-1,300 square feet. Still on the same Esplanade North corridor, further condo hunting of affordably priced units could yield positive results at the Imperial House of Venice built in 1970 just six stories high. Typical pricing of its condos falls within the $100s‒$500s range, for two-bedroom units having floor areas of between 750 and 1,100 square feet. 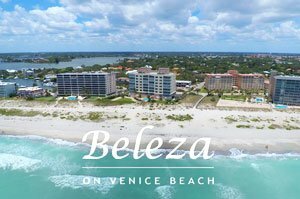 Like the Beleza, it offers breathtaking gulf views and enjoys easy access to the laid-back but charming downtown of Venice. Below are the current real estate listings available at Beleza on Venice Beach. Listing courtesy of: SOLDBOT INC.